An Indian pilot shot down over Pakistan and paraded by his captors has become a hero in his own country, a trump card for Islamabad and perhaps the key to bringing the arch-rivals back from the brink. 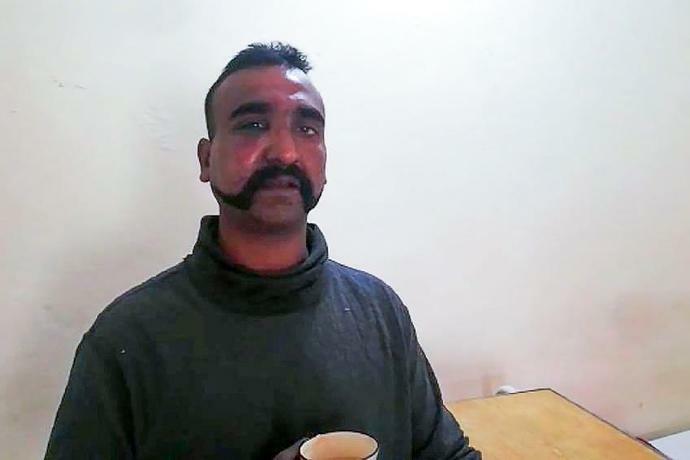 Wing Commander Abhinandan Varthaman was in a MiG jet that India said was shot down on Wednesday as he chased Pakistan warplanes over the rivals' disputed Kashmir border. Footage of him being beaten and interrogated has since gone viral in India and Pakistan. The incident has sparked fears that the showdown between the two countries -- who have fought two wars over Kashmir -- could spiral out of control. But Pakistan said Thursday it was ready to hand Varthaman back "if it leads to de-escalation". A foreign ministry spokesman said the pilot was "safe and in good condition". His experience -- broadcast in a series of graphic videos on social media -- was condemned as "vulgar" by New Delhi and sparked prayers and appeals from Bollywood stars for his safe return. But it was well received in Pakistan, with citizens praising soldiers for rescuing him from angry civilians and then treating him humanely and with courtesy. One video purports to show the pilot being dragged and beaten as Pakistani soldiers intervene, shouting "Stop! Stop!" Later, a separate shaky clip showed the bloodied, blindfolded pilot being interrogated, with the camera focusing on his name "ABHI" underneath winged insignia on his shoulder. It was his later appearance sipping tea, his face swollen and sporting bruises, but otherwise collected and calm, that was most seized upon in both India and Pakistan. In it, he thanks the "thorough gentlemen" who rescued him from the mob and compliments the tea as "fantastic". "This is what I would expect my army to behave as, and I'm very impressed by the Pakistani army," he said, his eye visibly swollen above an impressive handlebar moustache. It was unclear if he had been coerced to speak. That video was widely shown on Pakistani television, with still images used on the front page of many newspapers. "Indian pilot thanks Pak Army for saving him from mob," read a front page headline in the English-language daily Express Tribune. None of the footage was broadcast on Indian media, with the Times of India saying it was making "a conscious decision" not to use the images. On social media however, #GivebackAbhinandan and #Abhinandanmyhero hashtags spread quickly on Twitter and elevated him to national hero status. His polite refusal to proffer more details than necessary -- "I am sorry major, I am not supposed to tell you this" -- evoked particular commendation. "Such calm and resilience in the face of adversity. Prayers for our brave pilot #AbhinandanVarthaman," tweeted Bollywood celebrity Emraan Hashmi. Abhinandan told his captives he comes from southern India. Indian media said his father was a retired air force commander. Old footage purportedly shows Abhinandan quipping that a key attribute for a successful fighter pilot is a "bad attitude". AFP could not independently verify the video. Memories were rekindled of an emotional moment from 1999 when Indian pilot K. Nachiketa was captured after being shot down by Pakistan. He was returned a little over a week later. In this case, New Delhi has decried Abhinandan's treatment as a breach of the Geneva Conventions. 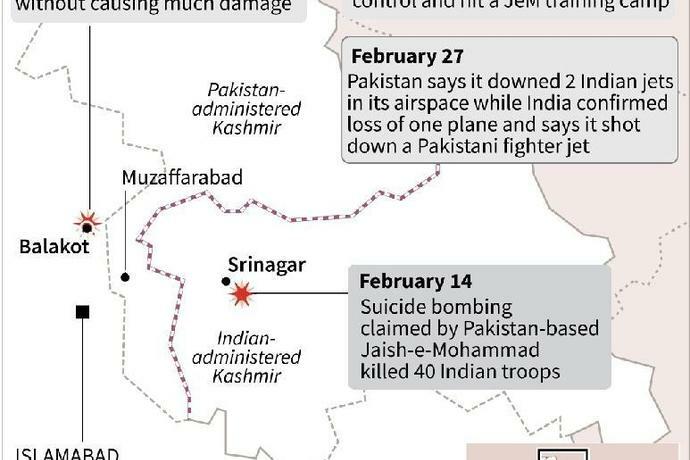 Abhinandan was captured a day after Indian fighter planes bombed what India said was a militant camp in Pakistan, retaliation for a suicide bombing in Kashmir on February 14 that killed 40 paramilitaries. He was among the fighter pilots scrambled to repel a Pakistani incursion over the border the next day, but his MiG-21 Bison was lost, India's foreign ministry said. Upon crash landing, the pilot was unsure which side of the border he was on and fired a pistol to scare off some boys who surrounded him, the English-language daily Dawn reported. He then fled on foot and tried to swallow some documents in his possession, the Pakistani newspaper added. The pilot's fate could prove central to de-escalating the latest hostilities between the neighbours, analysts say. Shortly after news broke that Abhinandan had been captured, Pakistani Prime Minister Imran Khan called for talks with India. "That actually could offer a pathway to de-escalation as well," Dhruva Jaishankar, foreign policy fellow with Brookings India in New Delhi, told AFP. But any mistreatment of the pilot "will create huge anger in India" and could escalate the crisis further, he added. Retired Indian lieutenant general R.S. Sujlana said Pakistan could use their captive as "leverage and start weighing their options". "If they release him as a goodwill gesture it will aid peace in the region," he told AFP.